We are reporting an interesting and unusual case of primary acquired cholesteatoma of epitympanum. This case is about the unusual pattern of spread, which defies the usual well documented pathway of cholesteatoma spread. Cholesteatoma tends to follow embryological planes that were formed during development of middle ear cleft. Most acquired cholesteatoma are formed by invagination of the pars flaccida into the lateral most portion of the epitympanum (The Prussak's space). Their spread is limited by these mucosal folds around the ossicles. These folds along with suspensory ligaments guide the cholesteatoma sac into the recesses of the epitympanum which are formed by saccus medius. Posteriorly it may spread lateral to the body of the incus (superior incudal space), inferiorly into the middle ear through pouch of von Troltsch or anteriorly into the protympanum. A 17-year-old male patient presented to our out-patient department with the complaints of right sided impairment of hearing since early childhood without any significant ear discharge. On evaluation, patient was having bulge in posterior canal wall. Audiometry revealed moderate conductive hearing loss in right ear. High resolution computerized tomography temporal bone revealed a peculiar finding. The cholesteatoma sac arising from Prussak's space was filling an enlarged cell lateral to Korner's septum. Mastoid antrum was normal [Figure 2]a and b. Patient underwent canal wall down outside in modified radical mastoidectomy. 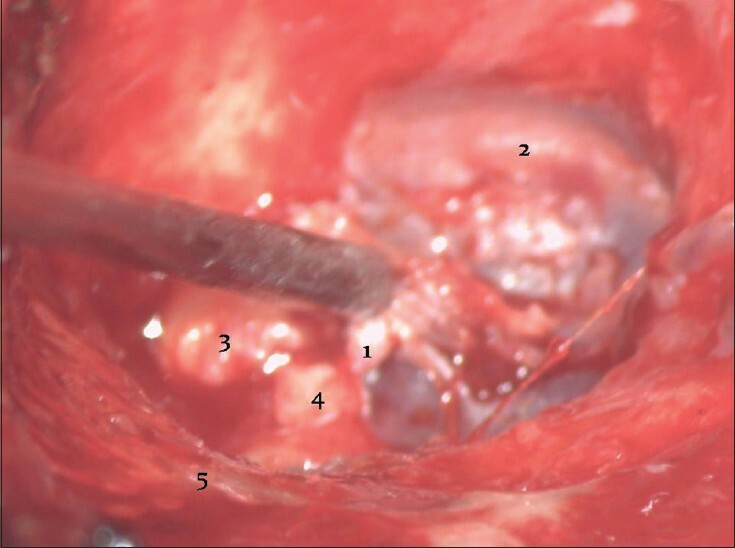 During surgery cholesteatoma sac arising from Prussak's space was found which was not spreading toward antrum (along superior incudal space) but involved air cells lateral to Koerner's septum  [Figure 2]a and b. 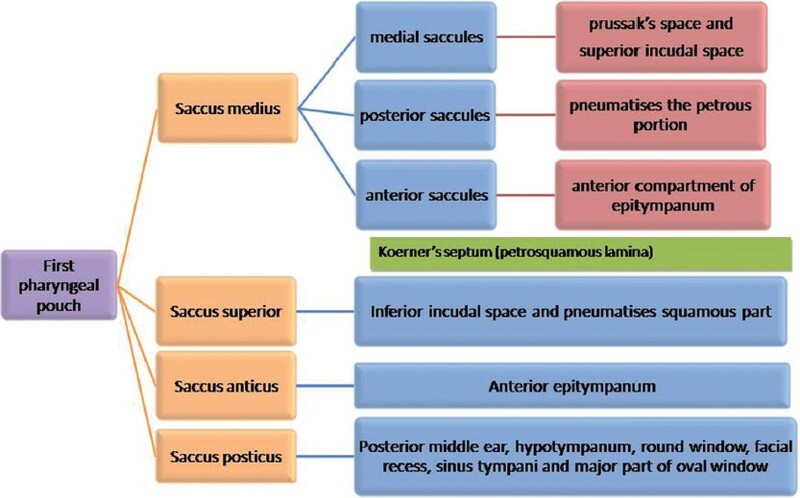 As it is arising from Prussak's space, by convention, it spreads via posterior route, where cholesteatoma sac spreads through the superior incudal space lateral to the body of incus and then it reaches the aditus and antum, thereby gaining access to mastoid [Figure 3]. In this case, the cholesteatoma spread is unusual. Post-operatively, the patient's recovery was uneventful. 1. Hammar YES. Study Concerning the development of the Vonderdarma and some ranger forming organs. Arch Anat Mikrosk 1902; 59:471-628. 2. Proctor B. The development of the middle ear spaces and their surgical significance. J Laryngol Otol 1964;78:631-48. 3. Proctor B. Surgical Anatomy of the Ear and Temporal Bone. New York: Thieme Medical Publishers; 1989. p. 66-84.